An emotionally devastating and confronting, yet hypnotic meditation on grief and the impact of war. Grief is different for everyone, which makes it hard to talk about and even harder to authentically represent in art. When a film tries to tackle something like grief, it often feels somewhat forced, unnatural and simply pulling up short on what grief truly feels like. However, Samuel Moaz t depicts grief sincerely, and in a way that reflects how real people respond to loss. Foxtrot manages to express the almost out-of-body experience of grief where nothing feels quite real and time moves slowly. This feat is largely due to Moaz’s sensitive yet stylish direction which captures grief as a period of disorientation – simultaneously feeling numb rather than just being a period of sadness and remembrance. 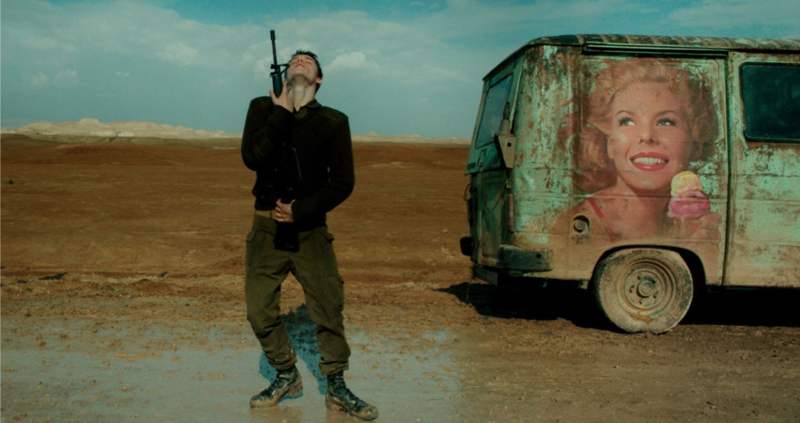 Set in current-day Israel where the ongoing Israel/Palestinian conflict has left the country in a state of normalized numbness, the film opens on a soldier ringing the doorbell of the Feldmann residence. Daphna (Sarah Adler) opens the door to see the soldiers, and without the soldiers needing to say a word, Daphna knows what they’re here for and faints. Her husband Michael (Lior Ashkenazi), is given the devastating news that their son has fallen in the line of duty. Michael is advised that it is important he drinks water every hour, even if he doesn’t feel like it. A phone alarm is set up to remind him. His face is stoic. Moaz makes the camera stay on Michael’s face for minutes on end; he can’t escape his current hell and neither can we. After the soldiers leave their house, the camera follows Michael from a bird’s eye perspective as he leaves the chair and walks down the hallway. The camera is slowly but constantly moving as we see him walking along a carpet with a kaleidoscopic pattern. We are as disorientated as he is. Every moment we spend with Michael is disarmingly in his shoes- it’s a place no one wants to be, but because the film gets grief so right, it’s utterly captivating to watch. The film then shifts perspectives completely and becomes a film following four young soldiers at an outpost, manning a roadblock. It is an understatement to say these men are bored. Their entertainment throughout the days contain raising a gate for a rare camel to pass in, letting through Palestinians and dancing with guns (the already iconic image of the film). The place where they sleep is also slowly sinking, but most of them don’t seem to be too fussed about it. If it seems that I’m being vague about the plot, it is because it’s a film that is best to go blind into. However, it’s important to note right-winged Israeli Cultural Minister Miri Regev has slammed the film for its “anti-Israel narrative”. It is obvious Moaz is incredibly anti-war. He has stated “If I criticize the place where I live, I do it because I worry. I do it because I want to protect it. I do it out of love.” The film does have an anti-war message, but it isn’t “propaganda”, it’s a human story that shows us why change is needed. All in all, I could speak about Foxtrot for hours on end. It is a film I want to see again and again. Although far from an easy watch, it is an emotional and confronting, yet hypnotic meditation on grief and the impact of war. It is essential cinema. Foxtrot will be screening at UWA Sommerville from the 5th of March – 11th of March & at ECU Joondalup Pines from the 13th of March – 18th of March as a part of the Perth International Arts Festival. Buy tickets here.